Black Widow Spider Rig - 'More Lines, Less Trouble.' - 100% Cotton - White T-Shirt comes in MENS sizes. 5760 Base Screws - measurements: 1/4-20 x 1/2 " includes 4 per package. 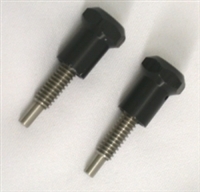 WARNING: Cancer and Reproductive Harm- www.P65Warnings.ca.gov Spring Loaded Pull Pin for the 5710 Series of Rod Holders (2-Pack). WARNING: Cancer and Reproductive Harm- www.P65Warnings.ca.gov REPLACEMENT BOLTS FOR 5710 ROD HOLDERS 2 BOLTS AND 2 RETAINER RINGS PER PACKAGE. 1/4-20 X 1". Boot to fit the 5760 bottom plate. size is 4" X 3"